Okay, so what else? First, a two day sleep-over at Melinda and Kihan’s house; a mix of business (as it were) and pleasure. I’ve got a painful varicose vein on my right leg and saline injections ten years ago followed by six months of support hose were ultimately unsuccessful. Now that I’m taking a break from treatment, it’s a convenient time to go after the vein again. Kihan is a surgeon and will be performing the procedures (laser and then removal), so I scheduled an ultrasound and consultation with Dr. Lee but was also squeezed in a good time. In a couple of weeks, the vein will be history. On August 8th David and I marked our 21st wedding anniversary. We drove to Portland, Maine for dinner at Hugos. I slept on the way, lulled by motion and the warm car (no, I wasn’t driving). A clap of thunder startled me awake; the sun was shining and I’d been dreaming. 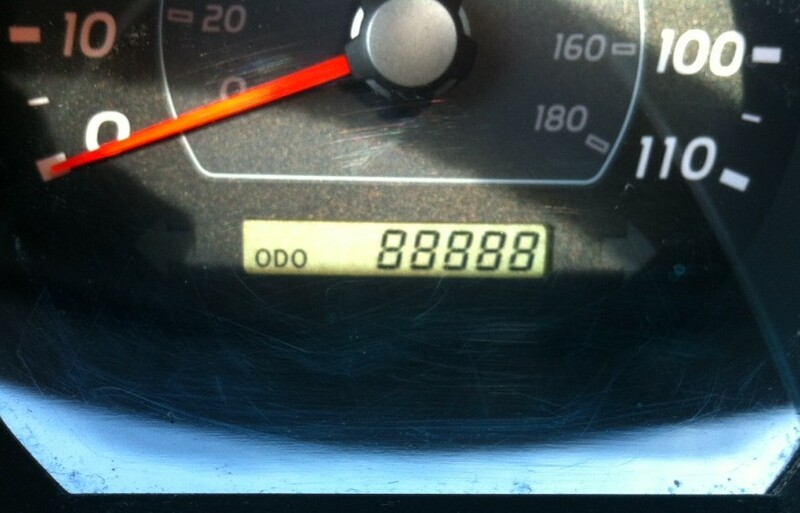 David pointed to the odometer: in a few more miles it would hit 88888. Remember, this was happening on 8/8/13. It all felt rather auspicious, and we took an earlier exit so that David could snap a photo. Dinner was delicious. I also had my six month mammogram; the calcifications in my right breast require no immediate action but warrant a revisit in another six months. 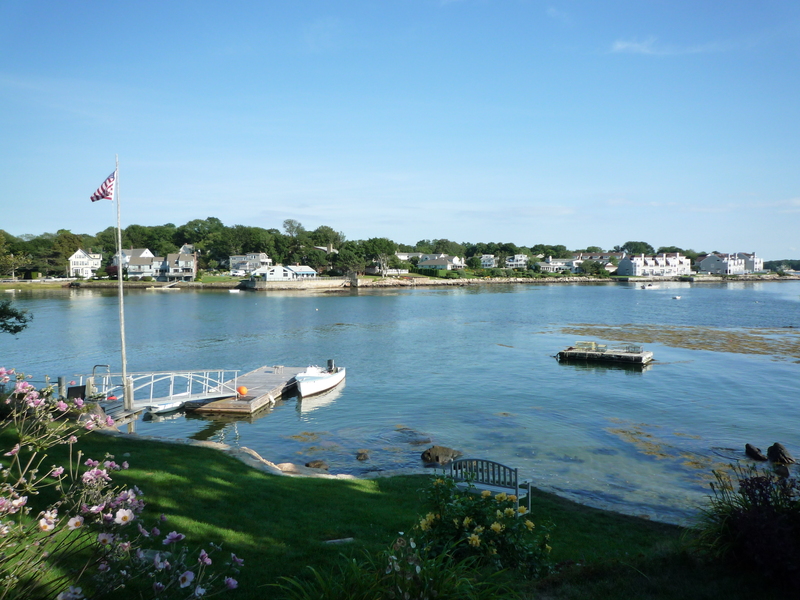 Afterward, I drove to Gloucester for a visit with my friend Laurie Geary. Laurie also has stage IV lung cancer, but it’s hardly slowed her down—we spent the afternoon sailing. I am somewhat directionally impaired (as in, have trouble following directions), and generally find a sailboat a highly stressful environment. However, Laurie is a gentle captain, the day was beautiful, and we couldn’t have had a better time. I left with a copy of Laurie’s recently published book, Dancing Through Cancer. Laurie also has a blog of the same name, where you can catch up on all of her adventures. Two days later I was back in Boston for the monthly PFAC meeting and what I have come to see as a social event, an appointment with my thoracic social worker. And the week after that, I checked in with Dr. Shaw. We’re accustomed to seeing a good deal more of each other and I’d really missed her. However, I also stressed how much I have enjoyed this break and that I have been feeling really, really well. I also had to acknowledge that my cough is making a comeback and so we agreed to bump up my next CT scan—I’ll report to radiology in three days. Next installment: one big party! This entry was posted in Uncategorized and tagged Dancing Through Cancer, Laurie Geary, stage IV lung cancer. Bookmark the permalink. Congratulations on your anniversary and all those 8’s! Very cool. It made me curious and I just googled the meaning of 8; you may already know this but this is what I found: “…, as with many other single-digit numbers, the shape of the number reflects its most important attribute, and in the case of the number 8, that is, first and foremost, balance.” It seems to me you have just attempted some semblance of balance with your reprieve from treatment. Good luck with the upcoming appointment/tests. So happy that this break has been joyful for you. Much needed, no doubt. Hmmm, I did not know this about numbers (shape being important). My ‘lucky’ number is eleven, eleven as in 1111. I’ll have to research what the shape of a one connotes! I am on crizotinib. What has Dr. Shaw’s philosophy been regarding routine brain MRIs for ALK positive patients? My onc doesn’t feel necessary, though I know other s on the Inspire blog do have routine MRIs every six months. Good to keep track what each place seems to recommend. Joy, I have BAC, which is very likely to stay confined to my lungs. Hence, I don’t have brain scans regularly (I believe the last was several years ago when I was experiencing some headaches). However, the brain is the achille’s heel for many ALK inhibitors, which often have difficulty crossing the blood brain barrier. Therefore, if I had a regular adenocarcinoma instead of BAC, I think current protocol would suggest a brain scan at least annually but preferably every six months; that is certainly what I would ask for. Hey Hedy, achieving balance (of any sort) has been a life-long quest. Most of the time, it seems just out of reach. Staying hungry (for balance); perhaps that is part of what keeps me going. Congratulations on your anniversary! That most have been so exciting and romantic. Thanks for recommending your friend’s book Dancing Through Cancer. Good look in your upcoming CT scan. Johanna, Laurie (Dancing Through Cancer) is a dynamo, and she and her book are both inspirational. And thanks for the good wishes. I went to Hugo’s website and I therefore strongly recommend that you try the smoked chocolate ice cream for me! Good luck with your scan; keep us posted. Joan, I thank you for your personal research and that bit of advice—-I did not notice smoked chocolate ice cream on the menu but I think it sounds fabulous. And I see Dr. Shaw on Tuesday so shall report back soon thereafter.